From bicycle kicks, headers, hat tricks, handballs, penalty shots and goal kicks, soccer is a non-stop, action-filled sport. While you are watching the exciting back-and-forth action, let us keep up with the scores and times. 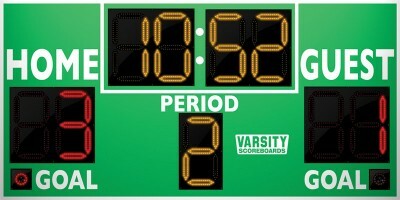 We offer everything from the most basic soccer scoreboard to one with all of the bells and whistles. 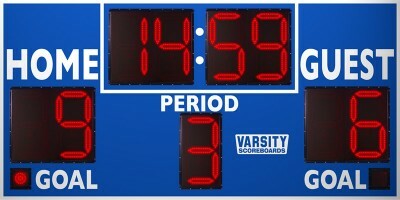 The basic boards feature game time, score and period. Some of the bigger boards include goal indicators, shots made, and penalties. 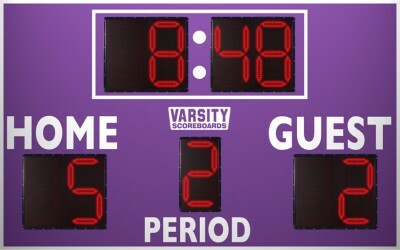 Scoreboards can also be customized with your team’s logo, sponsor panels, arches or more! 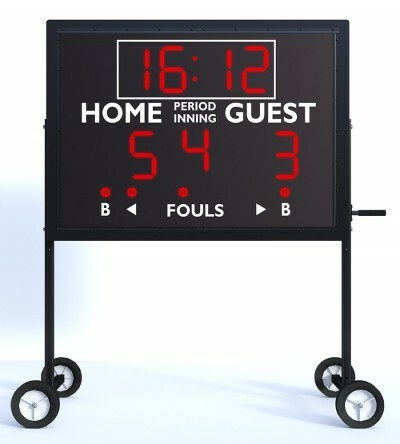 The 3431 is a compact indoor soccer scoreboard based on our outdoor model 3430. Scores are displayed in red and the Clock and Period displays are amber. Designed for medium-to-large sized venues, the 3416 allows you to really show off your soccer program. Our largest soccer scoreboard and also the most full-featured. Includes all the game information featured on the 3420 with the addition of Penalty counters.